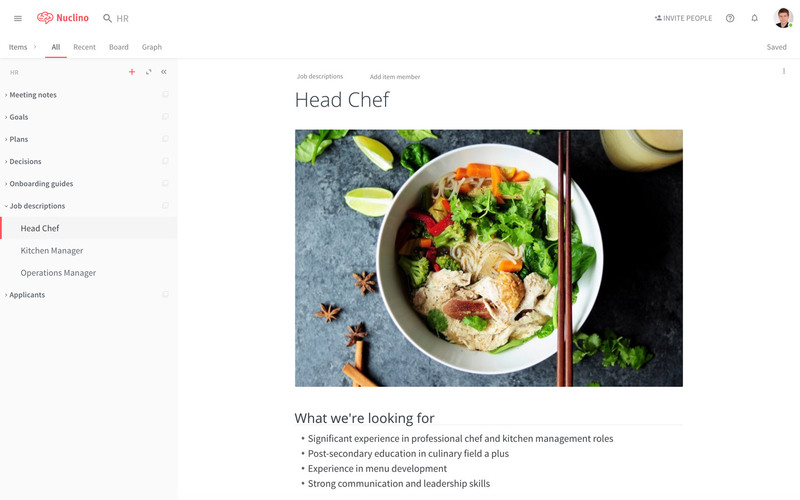 Hire, onboard, and retain great people with Nuclino as an easy knowledge base to capture onboarding guides, create job descriptions, and more. The HR team is the backbone of any organization. Yet without the right tools, they would end up with piles of paperwork that becomes outdated the moment it's printed. Whether it's hiring, onboarding, or building a lasting company culture, Nuclino helps keep your HR team on the same page. Turn your policies, guides, and manuals into living, breathing documents that are easily accessible and always up-to-date. Collaborate on job descriptions and share feedback on candidates to collectively decide who your next teammate is. Capture performance reviews and exchange valuable feedback – all within Nuclino. Create guides to speed up onboarding and reduce costs. Create better job descriptions by creating them collaboratively. Track job applicants in a visual way using the board view. Collaborate with your team in real-time on any HR-related content. Use comments to give and receive feedback on job descriptions and more. The board view provides an easy way to track applicants and more.